If your order weighs less than 13 ounces, save huge on shipping with USPS first class (with tracking number). This product weighs 5.7 oz. 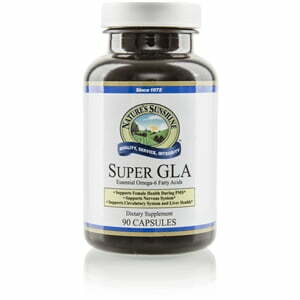 Nature’s Sunshine Super GLA Oil Blend supports circulatory, skin, joint, immune, and nerve health. The formula contains evening primrose, black currant, and borage oils, all rich sources of the essential Omega-6 fatty acids linoleic and gamma-linolenic acid. The body turns these essential fatty acids into eicosanoids, including the eicosanoids prostaglandins, thromboxanes, and leukotrienes which support several key bodily functions. 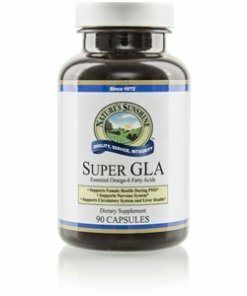 In addition to circulatory, structural, immune, and nervous function, Super GLA nourishes the female reproductive system, particularly before menstruation to alleviate typical menstrual symptoms. Gelatin, carob extract, glycerin, and water.